This week I wanted to take a trip over to Disney’s Wilderness Lodge and step into Whispering Canyon Cafe. If you have never had the chance to eat at Whispering Canyon Cafe, I highly recommend it! You will never go hungry. Ribs, pork, chicken, sausage, potatoes, baked beans, corn…. Just like the resort, the theme of the restaurant has a rustic and western feel. As you will see, eating at Whispering Canyon Cafe is an experience in itself, as the Cast Members provide a ‘yeehaw’ time! You will see a card on your table with one side colored green and the other side colored red. Keep your card on the green side! 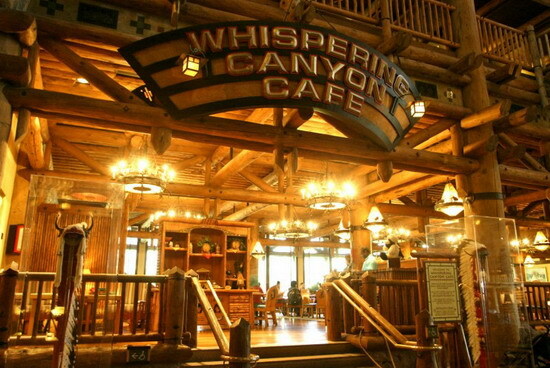 How many of you have eaten at Whispering Canyon Cafe? Tell me about your experience without spoiling the surprises! Comment below! I’ve asked for ketchup before, but have never heard of the card. Is this new or something I’ve missed? It’s been almost 5 years since we’ve eaten there. Suzanne, I am actually not sure how long the card has been there. Lots of fun though! Thanks for reading!